Hamsters are known to be omnivores, meaning that they eat a variety of foods from both plant and animal origin. These can include seeds, fruits, vegetables, insects and other proteins. Hamster owners may want to be careful about their hamster’s diet. Some, however, may be interested in diversifying and may wonder about the safety of alternative food items. Ever thought of giving your fresh hamster fruit, such as apples? Are apples safe? Can hamsters eat apples? Read on to find out. How Safe And Beneficial Are Apples? The short answer is yes, you may feed apples to your hamster. However, this can be dangerous if certain precautions are not taken. These are related to their feeding cycles, their diet and how their digestive system works. 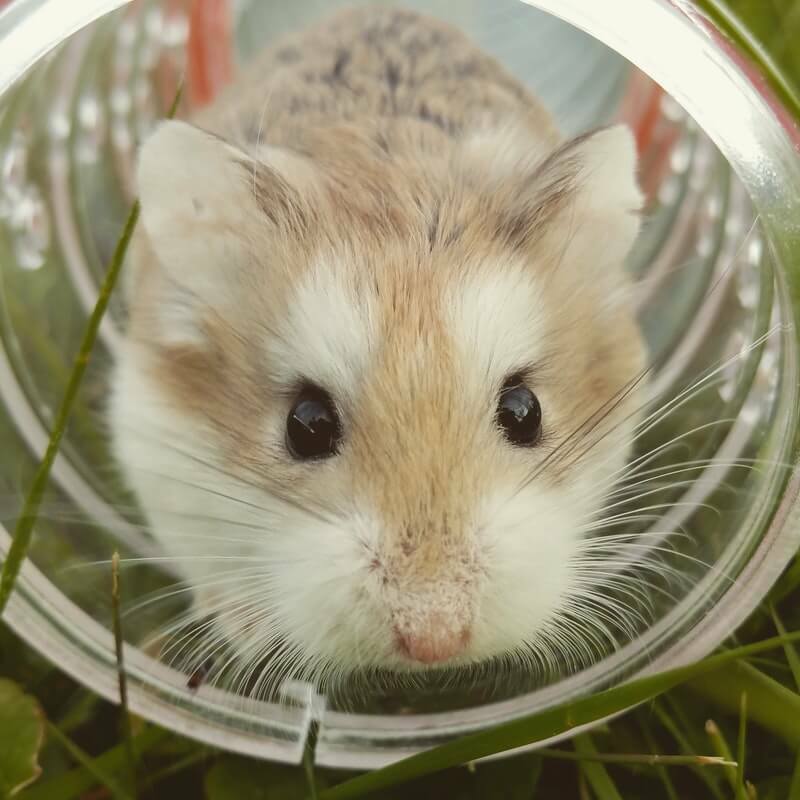 To understand just how to go about feeding apples to your hamster, it’s essential that we do a bit of background on hamster feeding, nutrition, and digestion. Hamsters’ digestive systems contain bacteria which help them to break down and absorb nutrients from the food they eat. However, some nutrients may still remain in the droppings that they expel from the body. This is why many hamsters eat their own droppings, termed as coprophagy. Though it seems disgusting, this is a natural part of their digestion process. Hamsters may suffer from indigestion if they overeat in a short period. This can cause hiccups, which can be potentially dangerous. Hiccups that last for greater than 24 hours need to be checked out at the veterinarian. Indigestion may also cause lethargy, and you might notice that your pet is sleeping more than usual. You can prevent this by feeding your hamster only small amounts at a time. Commercial hamster food is available at pet stores and may take the form of seed mixtures, pellets or grains. However, hamsters need fresh food on a daily basis so feeding them apples may not be such a bad idea after all. They should be fed once per day, and their habitat should be checked for leftover bits of food from the last previous day. A balanced diet provides all the appropriate nutrients that your hamster will need to carry out its bodily functions. 4 main types of food have been cited for hamsters’ balanced nutrition – grains, greens, vegetables, and fruits. However, these should be given in moderation, as hamsters can develop complications such as diarrhea, obesity, and indigestion from poor feeding habits. Hamsters can safely eat an appropriate mix of 12 grams in total of these foods daily. You can safely feed apples to your hamster. As you’ve read above, fruits are actually an essential part of their diet. Apples contain vitamins and minerals which are great for supplementing hamster nutrition. Ensure that any apple you feed to your hamster is seedless and peeled. It should also be sliced into tiny bites, to help with chewing and digestion. Think about quantity, bearing in mind the other foods you may feed your hamster for that day. A quarter teaspoon is recommended once or twice per week is a good start to see if your hamster will take to apples. Before assimilating apples into your hamster’s diet, you will need to make sure there isn’t any adverse reaction. Follow these guidelines before you start feeding them apples regularly. Ensure it’s fresh, peeled, washed, and doesn’t contain any pesticides or preservatives. Check that your hamster can comfortably digest apples. You can feed them a small piece and wait a few days to watch for any adverse reaction. Slowly increase the intervals at which you give them apples, provided that your hamster tolerates it. For apples or any other treat, you may want to give to your hamster the following should be observed. They are known to have obesity-related complications, especially if they don’t get enough exercise. Their cheeks are able to store up to half their body weight in food and hamsters can store any excess food. They will generally hide these bits in a stash somewhere in their living area, and nibble on these morsels throughout the day. These provide no nutritive value. Also, sweets may stick onto their cheeks, causing abscesses and may lead to infections. Hamsters’ teeth grow throughout their life. Therefore, it’s crucial for them to gnaw continuously, to wear them down. Feeding them foods that are a little hard will help with this, as overgrown teeth can interfere with eating. When their teeth are overgrown, they may also instinctively bite on their cage, causing traumatic breakage and pain. Ensure your pet has access to clean water at all times. Using a water bottle designed for easy access may help. This is more effective than a bowl, in which hamsters may want to soak, potentially causing drowning or pneumonia. When selecting a bowl for your hamster, go for one that’s not too large. These sometimes take up to much space in the cage and may facilitate overfeeding. Ceramic material is best, as it is more cumbersome and more difficult to overturn. In contrast to plastic, ceramic bowls are durable and more bacteria resistant. No pesticides or preservatives. When opting to feed your hamster fresh food, ensure its organic. In addition to getting these foods from safe sources, cleaning and peeling are essential. This is because hamsters do not tolerate the chemicals well. Check your pet’s cage for bad or sour bits of food that they may have hidden. This is especially important when feeding with apples and other fresh foods, as these tend to go rancid quickly. Finally, don’t feed your hamster only apples. A varied diet is essential to meet your pet’s metabolic demands so you will need to consider a mixture of all the necessary foods. Having questions about feeding your hamster is perfectly reasonable. Always remember that hamsters generally have a varied diet so any one type of food may not be overly detrimental. What’s important to remember, though, is quality and quantity. Even though apples are different safe hamsters may respond differently, depending on species. Do try to be on the lookout for any adverse reaction and seek medical attention if necessary.